In the race for the presidency of the United States, a lot of money is spent on marketing candidates. And it is on one of largest stages ever created. When marketing mishaps occur – not in the message, but in the execution of the tactics – it is an even larger deal than if say, you or I made the misstep. So let's take a look at three marketing mishaps which were made recently and learn from them. First – What the heck happened to JEBBUSH.com? Presidential candidate Jeb Bush lost track of his name URL. His NAME! How the heck does that happen? And who bought his URL? How the heck do you keep that from happening? 1. Keep track of your URLs. It would be helpful if they are all bought (or bought and then moved to) at the same place. I have them in 7 different accounts, so learn from my mistake because they are easier to track. All of the services send emails when the URL is about to expire so pay attention to your emails and create a master list. If they expire at different times, you can ask the company to change their expiration dates to ONE date by paying a pro-rated amount. 2. You may want to renew them early and if it is your main URL, renew them for a long period of time. 3. Watch your competition. Watch some of your competitor's URLs. That is how I was able to register SedonaMarketing.com in addition to SedonaMarketingRetreats.com. The URL expired and we grabbed it as soon as it was available. We have a Watch List of other URLs. 4. You should have similar URLs to your URL. Our corporate promotional product company, Promotionally Minded gets referred to as Professionally Minded all the time. We bought that URL and redirected it to the main one. 5. I am just going to repeat #1: PAY ATTENTION. You are going to be able to avoid this issue if you check out where the stock photos and video you purchase come from. Better yet, shoot your own photos and video so you own them. Third – Video can REALLY get you in to trouble. Donald Trump ran an ad talking about immigration. It showed people scrambling across a border. The trouble was, it was the border of Morocco. 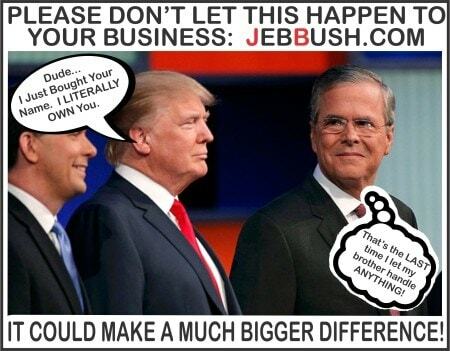 Let's thank our POTUS candidates for their marketing mishaps which will help us make our businesses more successful. And if you want to talk about using video or special URLs to make your marketing stand out, give us a call at 800-705-4265.